I was stopped abruptly a little over half way down the first printed page of a Cold war timeline given to me by David Cole. Under the heading 1950’s a bullet point states that in 1954 the “CIA help[ed] overthrow unfriendly regimes in Iran and Guatemala.” (http://library.thinkquest.org/10826/timeline.htm ) This sentence made me think of the quote posted on one of the walls at the Nike missile site, “How do omissions in the historic record influence my understanding of history?” What is selectively omitted by glossing over these CIA lead coups to overthrow democratically elected Leaders? “Unfriendly” was the word that stopped me. What exactly is the author of this timeline trying to lead his/her reader to think by using the word unfriendly? “Unfriendly” has negative connotations. In this context it could lead one to the conclusion that leaders of Iran and Guatemala were pursuing military agenda’s in some way aggressive towards the U.S., when in truth the leaders of Guatemala and Iran in 1954 were democratically elected champions of the people. Is the author using the word unfriendly to reference the fact that at that time the leaders of Iran and Guatemala were not willing to bend to U.S corporate interest? Or is the author insinuating a communist threat posed by the these two newly established democracies? These are both major events in the history of the United States. The overthrow of Mohammed Mossedegh, Iran’s first democratically elected leader, in 1953 was the first time the CIA had been involved in the covert overthrow of another countries democratically elected government. It set a precedent for the overthrow of governments unsympathetic to U.S and British corporate interests. The CIA’s overthrow of Arbenz followed the same patten. Begin with a democratically elected leader championing reform in favor of the people against corporations. Next the United States becomes involved under the guise of anti-communism. The Government is then overthrown through covert tactics including but not limited to bribery and created chaos through false uprisings. In the end a brutal and oppressive government is put in place that is sympathetic to U.S. and British corporate interests. Both of these coups glossed over in the specific timeline given to me by David Cole have reverberating effects today. They are examples of the United States covert arm working on the part of corporate interests overthrowing infant democracies culminating in the installation and support of brutally oppressive military dictatorships. our history is in some ways written between the lines, visible in the unwritten, in the omissions. Image from the CIA lead coup that overthrew Mossedegh in 1953. The ragtag Rebel Army in Guatemala funded by the CIA. 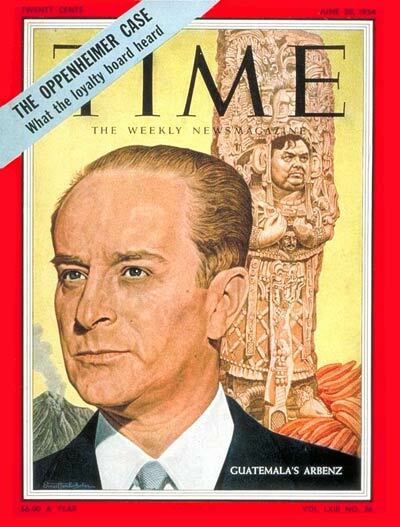 Arbenz on the cover of Time magazine. June • Support grows for the nationalization of Iran’s oil industry. March • Prime Minister Ali Razmara is assassinated. March • Nationalist Mohammed Mossadegh becomes prime minister and angers the British by wresting control of the oil industry. July 17 • Due to growing friction between the shah and Mossadegh over oil, Mossadegh resigns. Ahmed Ghavam takes over as prime minister. Three days of rioting ensue. July 22 • Under pressure, the Shah is forced to reappoint Mossadegh. March • The C.I.A. begins drafting a plan to bring to power, through covert action, a government in Iran that would be preferred by the United States. April 16, 1953 • A C.I.A. 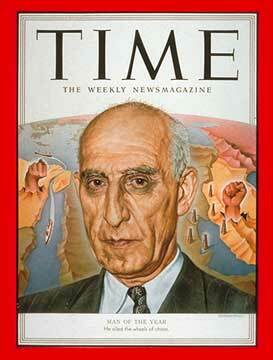 study entitled “Factors Involved in the Overthrow of Mossadegh” is completed. The study concludes that a coup in Iran is possible. e C.I.A.’s Tehran station is granted approval to launch a “grey propaganda” campaign to discredit the Mossadegh government. June 10 • C.I.A. officers meet in Beirut for a final review of the coup plan. June 19 • The final operation plan for the coup, agreed upon by both the C.I.A. and British intelligence, is submitted to the U.S. State Department and the Foreign Office in London. July 1 • Britain’s prime minister gives final approval to the operational plan for the coup. July 11 • President Eisenhower gives final approval to the operational plan for the coup. July 23 • A British Foreign Office memorandum is presented to an Under Secretary of State, reassuring the U.S. that the British would be flexible on the issue of controlling oil in Iran. July 25 • Under pressure from the C.I.A., Princess Ashraf, the Shah’s sister, flies to Tehran from France in order to convince the Shah to sign the royal decrees that would dismiss Mossadegh. • The C.I.A. intensifies a propaganda effort, which included planting stories in major American newspapers, to weaken the Mossadegh government. Aug. 1 • In a meeting with Gen. H. Norman Schwartzkopf, the Shah refuses to sign the C.I.A.-written royal decrees firing Mossadegh and naming Gen. Zahedi as the new prime minister of Iran. olds a referendum calling for the Iranian parliament to be dissolved. Aug. 13 • The shah signs a royal decrees dismissing Mossadegh. Word of the shah’s support for the coup spreads quickly in Iran. Aug. 15 • The coup begins, but falters and then fails because Mossadegh received advanced warning of the plans. Zahedi goes into hiding. Aug. 16 • The shah flees to Baghdad. Aug. 19 • Several Tehran newspapers publish the Shah’s decrees. 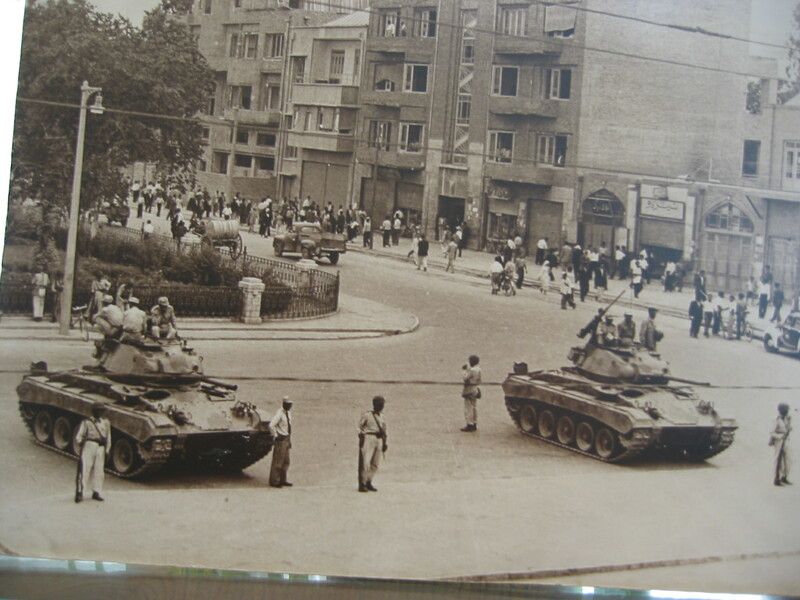 As a result, supporters of the Shah begin gathering in the streets, and another coup begins. Gen. Zahedi comes out of hiding to lead the movement. By the end of the day, the country is in the hands of Zahedi and members of the Mossadegh government are either in hiding or incarerated. • The crushing of Irans fledgling democracy resulted in more than two decades of dictatorship under the Shah. • Headquarters are established in Florida for the operation to overthrow Arbenz. • With Zahedi acting as prime minister and the pro-Shah army units in control, hundreds of National Front leaders, communist Tudah Party officers and political activists are arrested. • Mossadegh’s minister of foreign affairs, Hossein Fatemi, is sentenced to death and executed. • The Anglo-Iranian Oil Company resumes operation. • June 18 Castillo Armas’s U.S backed forces invade Guatemala. • Guatemala descends into civil war following U.S lead Coup of the democratically elected Arbenz government. The day was gray and windy. The wind pushed Daniel’s car around the highway like a rag doll. Our wet and windy drive down the two-eighty(280) reminded me of my Oregon roots. It felt nostalgic to be encompassed by grey and drenched by rain. Mary reiterated this feeling of nostalgia by calling our attention to the similarities between our northern California coastal environment and the environment of Ireland. 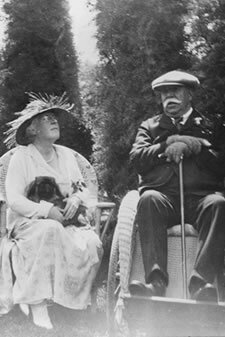 How closely related our climate is to that of Ireland’s is the primary reason The Bourns chose Woodside California as the home of Filoli. The site with its temperate climate and rolling hills offered Mr.Bourn a sense of nostalgic similarity to Muckross, the estate in Ireland that he loved so much. When Mr. Bourn was no longer able to travel to Ireland, he commissioned paintings of his beloved Muckross to be done in the ballroom of Filoli, These were executed by Bruce Porter. We can see these enduring design elements clearly in the garden. I will focus on two of these elements, repetition and geometric symmetry, as seen in Filoili’s gradens. A portion of the garden is designed after the rose window at Chartres Cathedral. 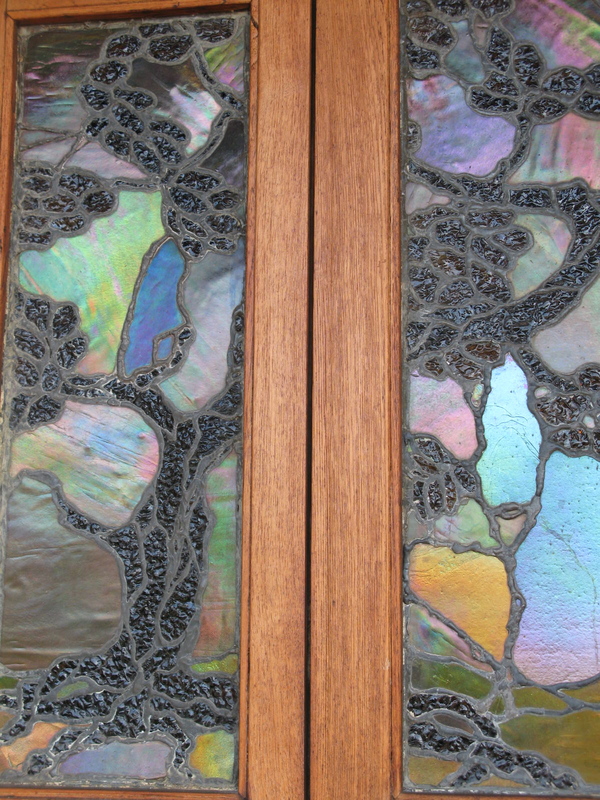 In this interpretation the colors of the stained glass have been painted with flowers. 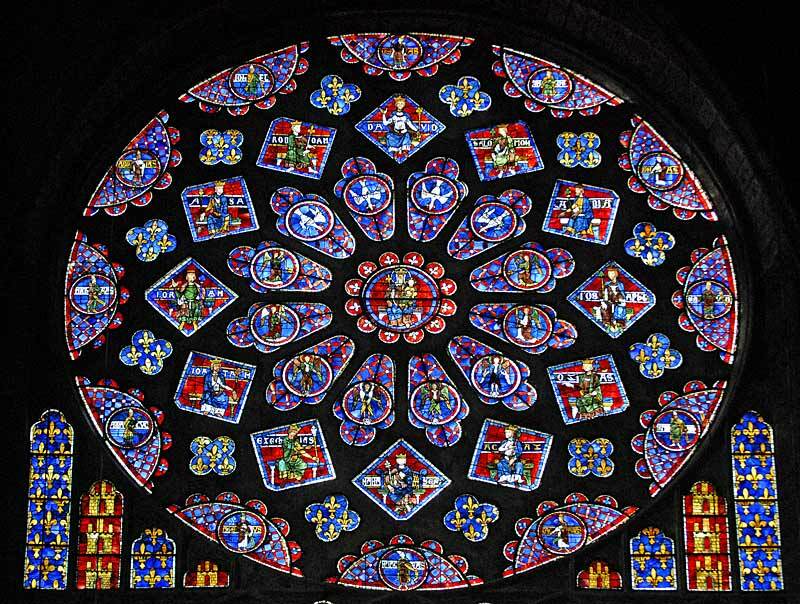 A rose window is an iconic example of geometric symmetry used in design. In rose windows the geometric symmetry is laid bare for the observer to see. Geometric symmetry is also used as an invisible underlying symmetry, adding structure to design without being visually depicted. Repetition can be seen in the garden as well. Entering the grounds you are met with countless Olive tree’s arranged along insinuated lines. The repetition creates a rhythm. This rhythm is carried throughout the garden with many trees and plants being used in multiples. Two of the trees chosen are the magnolia and the Irish Yew, By using these trees in multiples Porter is emphasizing their qualities and associations. The copious magnolia trees in bloom perfume the air with the delicate aroma of spring, smell is a sense strongly associated with memory. This smell might trigger a different memory for each guest to Filoli. The many Irish Yews ring a nostalgic call home to their motherland of Ireland that their new home was created to emulate. Repetition is used in the composition of gardens, music, art and prayer. Repetition creates emphasis. 1877 William Bourn Jr. inherits the Empire Mine from his father. The Bourn’s fortune used to acquire Filoli was generated by this mine. 1882 Matson navigation Company Founded by Captain William Matson. This Company generated the capital used by the Roth’s to purchase Filoli. 1906 Much of San Francisco is destroyed by the earthquake and subsequent fire. Worries about seismic activity lead people with the means to build expensive houses down the peninsula away from San Francisco. 1910 Bourn acquired Muckross House and its surrounding 11,000 acres in Ireland for their daughter and new son-in-law. Mr. Bourn loved the Irish country side and chose Woodside California as the location for his new estate because of its similarity to the Irish weather and landscape. 1917 Construction of Filoli complete. 1917-1922 Bruce Porter collaborates with the Bourns to create Filoli’s elaborate gardens. 1936 William and Anges Bourn pass away and the estate is sold to Mr. And Mrs. William P. Roth. The Roth’s owned Matson navigation Company. 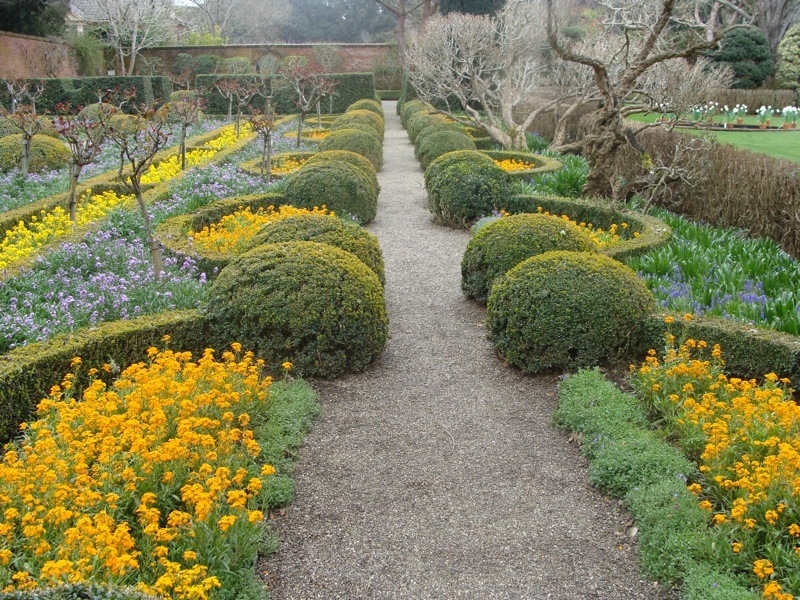 During the Roth’s stewardship of filoli the batanical gardens were built. 1975 Mrs.Roth donates Filoli to The National Trust for historic Preservation. Arts and crafts, do you really want to know how I feel about the Arts and crafts movement? Honestly I feel guilty about my inherent distaste for the forms that the Arts and crafts movement takes. It feels to me like a hodge-podge of influences. So many influences that none of them are fully realized. I appreciate the ideals behind the arts and crafts movement, among them “”the conviction that a building must respond to its surroundings.” (pg. 259, America:The Quest for Democratic Design) A bringing of the outside in, and cohesion of the outside with the inside through the use of materials and motif’s particular to the local landscape. One example of this integration in the Thorsen ultimate bungalow is the wisteria growing outside on built in trellises, that wisteria is also depicted in a stained glass window beside the front door. I see the visual correlation but the actual stained glass has a clunky and messy feel. The built in planters for the wisteria to grow in were also ill-conceived, inviting the plants to damage the structure of the house. The tile work in the dining room, I was told, represents vinca minor. Vinca minor is a ground cover especially suited to our temperate Climate, this tile work is meant to mimic the vinca minor growing outside. however, I do not see a distinct visual correlation between the forms of these two plants. I suppose you could see a general circle shape transposed onto either flower. One of the most basic distinguishing features of a flower is its number of petals. Vinca minor has five petals, these petals always overlap with one side of each petal over and one side of each petal under. 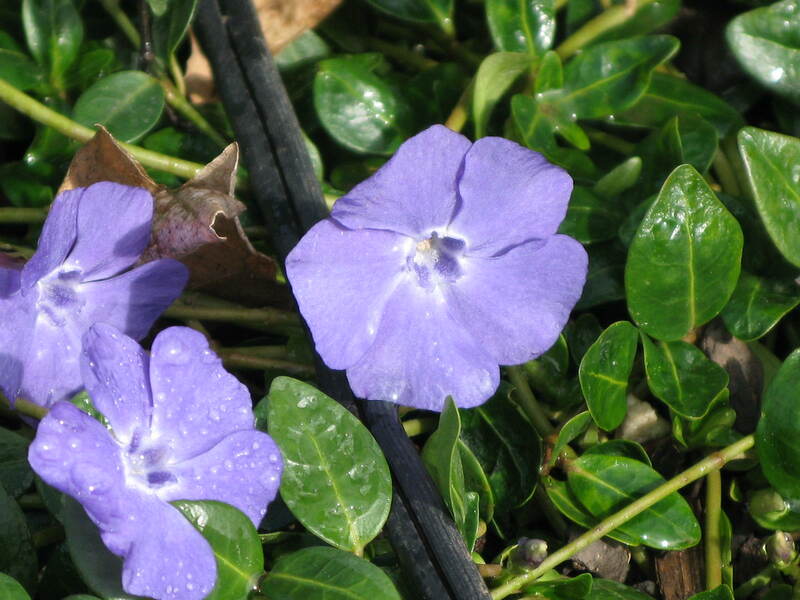 This makes vinca minor seem somewhat like a pin wheel, it has visual motion. The flower depicted in the tile work has only four petals. The four petalled flower is very stable and static. 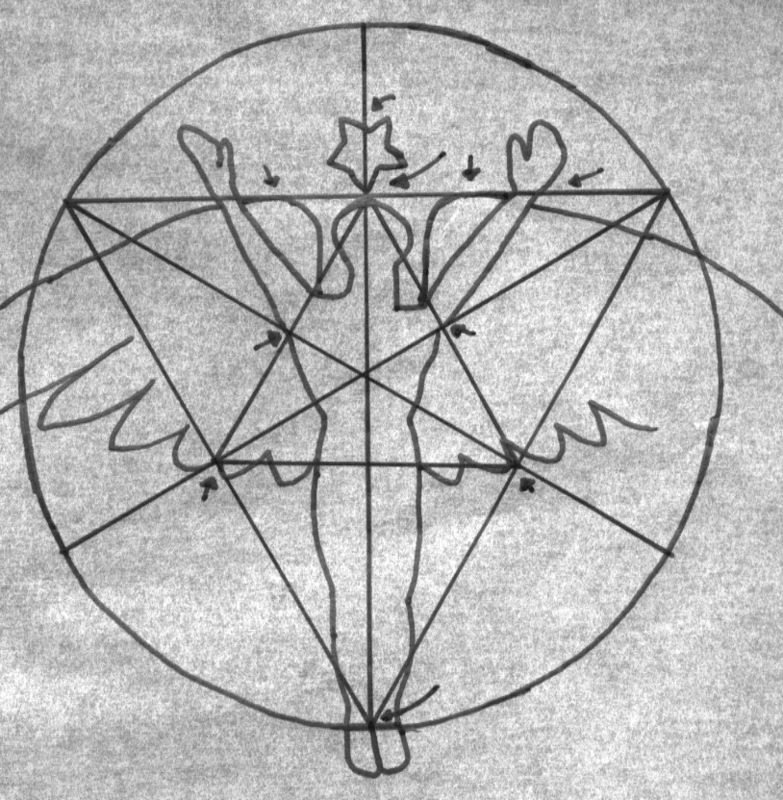 Numbers are highly charged in symbolism. I feel that either the tile work is being misinterpreted or the Arts and Crafts movement once again disappoints me with its interpretation of a beautiful ideal. 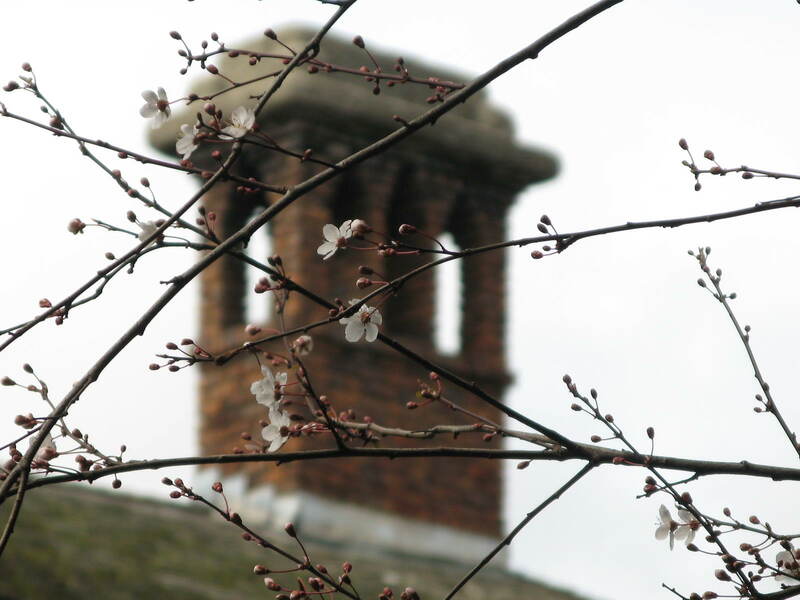 I see Japanese influence throughout the Thorsen house, it is in the cloud and cherry blossom motifs as well as the connection to the natural world outside and constant reiteration of the tsuba. I see the forms but I do not see the meaning. I think the American Arts and Crafts movement misses the subtleties of Japanese design . It appropriates the forms but does not tend to the deeper meaning and symbolism behind those forms. The movement aspired to democratic design. A design attainable to anyone spurred on by a growing middle class that had time for do-it-yourself projects. This ideal of democratic design was more fully realized in the United States than it was in Britain. The British were committed to hand craft. From this labor intensive hand craft beautiful objects were made, but were only attainable by the very rich. The U.S Americans did not have a long standing history with industrialization as Britain did. This allowed them to adopt industrial methods to produce their Arts and Crafts good. Through the use of industrial processes these design objects were made available to a wide audience. Tile work supposedly depicting vinca minor. Notice that this flower only has five petals while to real vinca has five, curious. Vinca minor growing outside of the Thorsen house. 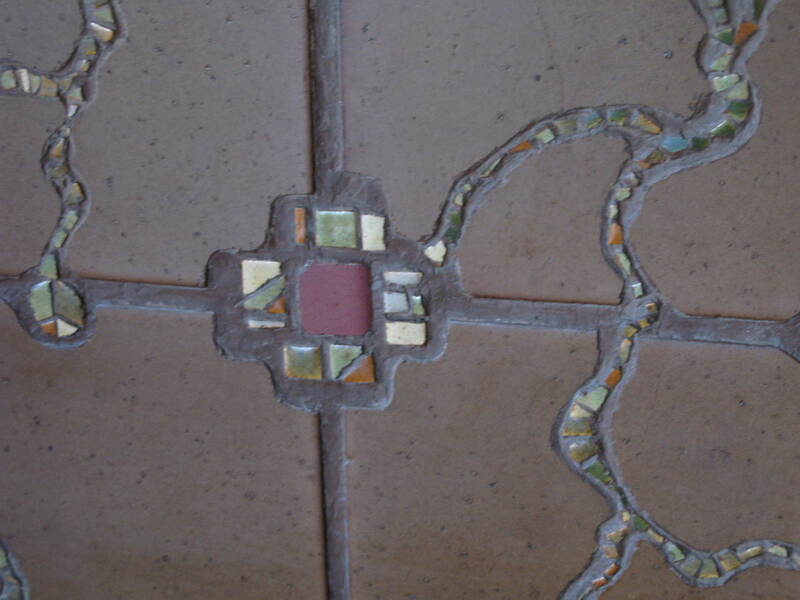 Do you see this as being the plant depicted in the dining room tile work? 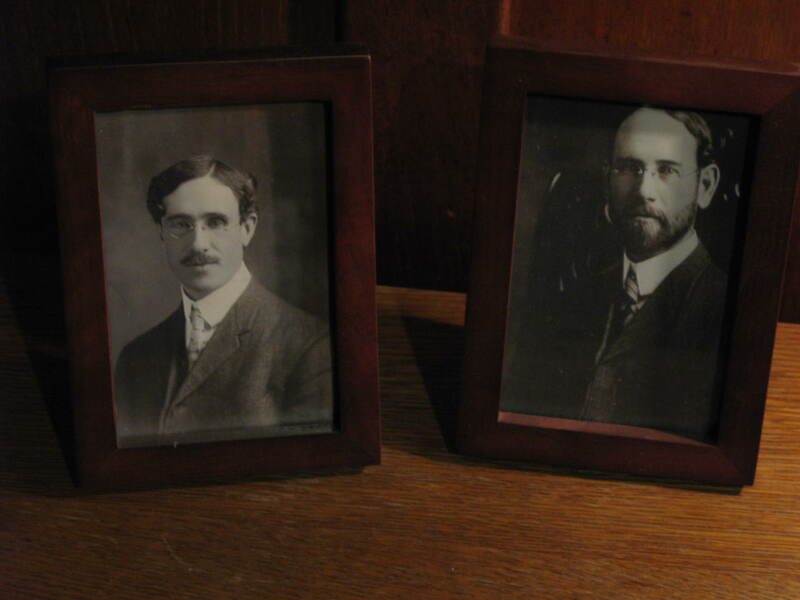 Green and Greene, the Architect's of the Thorsen house. Anticipation is key to my experience of classical music. Wheter it be Vivaldi, Bruckner or Philip glass. Timing is everything. Our experience was marked by an acute awareness of time. There was an astounding emphasis placed on time by the needs of the music. Even small aspects of our experience were affected by this need to precisely observe time. We were asked to arrive on the steps of Davies symphony hall promptly at 8:45am. This was at odds with the norm of meeting at nine then dashing off for fieldtrips around noon. We had to be punctual, the symphony waits for no one. Once inside every one around us was constantly checking their clocks. We were completely surrounded by clocks. Clocks counting down the seconds with a presence and immediacy that I had never experienced before. Rebecca and Deborah could not keep their eyes off of their watches, they are the administrators and must keep careful watch. Everything is timing in a symphony. My emotional response to the built environment changed dramatically in my transition from the backstage world of the orchestra to the onstage world of the orchestra and then to the world inhabited by the audience. Behind the scenes is a hectic buzz, filled with the nervous anticipation of counting down every last second. Once on stage this nervousness seems to subside. The clocks are gone, left in the world backstage. From the stage the chairs in the audience seem few, the presence of the audience is subdued. This feeling was enhanced by the decision to place the first rows of the audience below the orchestra, this effect was enhanced by the lines diverging from the stage to the back of the hall. Thus creating a diminutive view of the audience and providing the orchestral players with a sense of confidence and prominence over and created by their environment. Once in the world of the audience I felt a new variety of excitement, this one was not tinged by any nervousness or stressful attachment to time. It consisted of pure anticipation. I was in no way responsible for the timing and execution of what was to come, I was allowed to sit back and enjoy. To let the music take over my mind and lead it in any direction. The immensity of the seating and central position of the orchestra was revealed to me once I was nestled comfortably inside my auditorium seat. The Design of the interior space delivered the Orchestral section to the audience in a form of grandiose immensity lending to my excitment and anticipation. This sense of the orchestra being larger than life may have been created by the opposite dynamic to what was felt when onstage. In the audience the lines of the auditorium converging to the stage creating a visual tunnel leading your eye to the focal point of the stage. Mindfulness, to me, is the essence of the tea ceremony. The woman making our matcha paid close attention to every detail. She washed each cup with care, out of respect for the creator of the bowl and generosity to us. Every moment she concentrated on the present. She served us tea while in quiet meditation and practice. We were allowed to be part of her discipline, her lifelong journey with the art of tea. 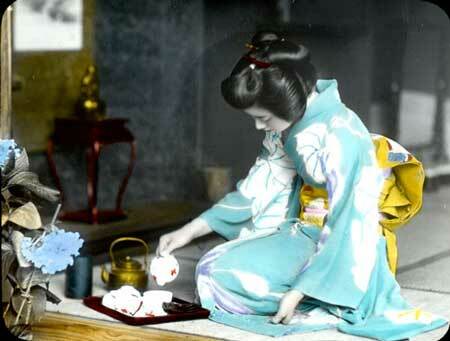 The tea ceremony is about concentrating on the moment and liberation from the outside world. In Zen Buddhism it is said that the whole universe can be experienced in the drinking of a bowl of tea. This experience comes from giving yourself over completely to the here and now and fully participating in the tea with a heart free from selfish desires. The tea ceremony sprung forth from Zen Buddhism. The monks ritualized the drinking of their tea. This ritual provided for alertness through the caffeine found in matcha, which aided their concentration during long hours of meditation. Everyone in the tea ceremony practices Buddhist ideals throughout the ritual. It is the principles in action; generosity in serving another person, mindfulness towards being gracious guest, and non-attachment in letting go of your rank and distinction. All aspects of the tea ceremony contain Buddhist significance. In a traditional tea ceremony you enter the garden through a gate. This gate represents kire (cutting) it is a direct cut from the outside world. It defines a change in the environment from public to private and allows a moment to reflect on leaving behind the “dust of the world” and entering into sacred space. Along the walk down the roji (dewy path) is another opportunity to reflect. “[The] roji [is] to be a place for abandoning the entanglements of this world.”(The Book of Tea, Sen Soshitsu XV and Asano Akira, Pg.233) After walking down the dewy path you come upon the teahouse, there may be a basin of water for ritual purification. In this you are literally washing away the dust of the world, preparing yourself for the inner sacred space. Each pause in the journey to the tea ceremony is a moment for reflection. If you are aware of Buddhist symbolism you will be able to read a narrative in the landscape, a story told through images, numbers, juxtaposition’s of materials and calligraphy. Once through the garden you enter into the teahouse. This moment is meant to inspect the chosen scroll and contemplate the theme chosen by your host. Next you venture through a very small door, at the base of the tearoom, everyone must go through this door to enter the tearoom. This is the humbling hole, so named because everyone must get to the same level before entering. This allows a moment to symbolically rid yourself of the hierarchies and distinctions of the material world. Once inside everyone is on equal ground, patiently sitting to receive the hospitality of the host. You cast of you social status to enter a tearoom. In the oasis of the steamy tea room there is no hierarchy. Along with your status all detritus of the outside world should be cast off. The walk down the roji, washing in the basin, and time in the gathering room are meant to serve as cleansing experiences. Giving you time to reflect and clean your mind from the distractions of the world. Leave the mundane world and enter a place of reflection, a place of seasonality where meticulous preparation has been done in anticipation of the fleeting moment that is teatime. Every detail has been considered to guide your thoughts and conversations. My first experience with the Japanese tea ceremony was focused on etiquette. We were told about the technique and reasons for each aesthetic decision. We were briefed on procedure; clean white socks, pants without rivets, shoes off at the front door, dirty socks off, clean white socks on, and slippers on before leaving the entryway. Slippers were worn in the gathering room and carefully removed before stepping onto the tatami. I was in a class entitled “Zen and the Japanese Garden”. This experience was of a more clinical nature than the experience I had on Friday. In that context details and specifics were important. In the context of this class the more conceptual, broad strokes were appropriate. The woman leading our tea gave us more information on the concepts behind the tea ceremony rather than the technical execution of it. We were given very little in regards to etiquette and prescribed ritual. We were allowed to contemplate the scroll and enjoy the experience without complicated explanations and rules. I appreciated the involvement of being the first guest; I had the pleasure of sitting closest to the boiling water. I could feel the steam, hear the boiling and see the glow of the coals beneath. The Shinto purification materials of water and fire were right in front of me. At one point a burst of sparks caught me off guard and made me think about the fragility of the structure around me. A single ember could bring this place to ashes. The structure has an ephemeral quality because of the materials used in its construction. Its walls are made of extremely fragile paper. A drip of water on them would surely distort the paper, a careless hand could punch right through. This materiality emphasizes the ephemeral nature of the tea experience and the care that must be taken in all aspects of the ceremony. We will have this tea but once and the experience will be gone, never again to happen in the same way. The level of care instilled in the student of the tea ceremony is meant as a way to cultivate a thoughtful interaction that extends far beyond the utensils used in tea. This instills a way of being that is mindful, kind, generous and appreciative, a view of oneself as a caretaker. We are only caretakers. Each object, each place, is not truly possessed, it is merely looked after for the next generation. The most poignant thing that Karen said was that she does not really own the Lacquer box, she is simple taking care of it for its real owner 200 years from now. 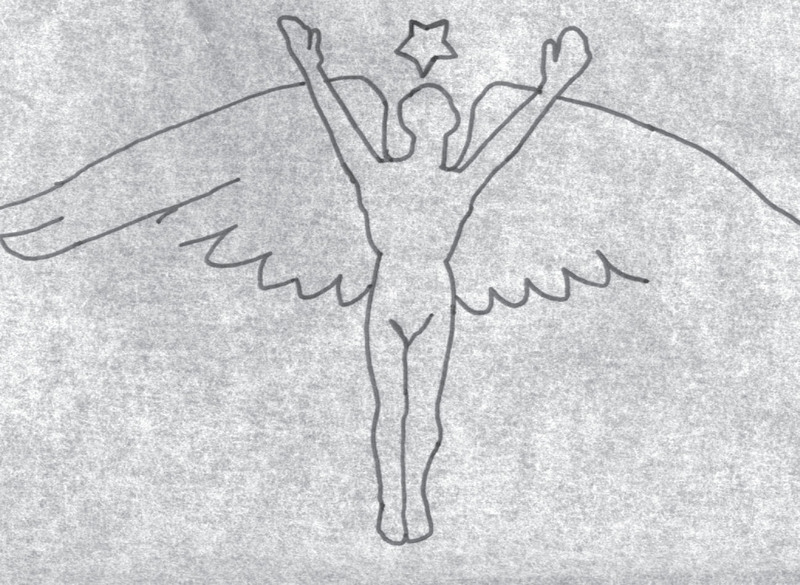 Here I have outline only the poseidon figure. I will be attempting to show its relationship to ad triangulum symmetry. The roaring twenties were a time of post war euphoria. The country was in a romantic mood and Art Deco reflected that sentiment. Art Deco originated in Paris at the Exposition Internationale des Arts Décoratifs et Industriels Modernes (International Exhibition of Modern Industrial and Decorative Arts). The goal of the exhibition was to find a new truly modern style. Zigzags and swirls were the outcome. Art nouveau and cubism are married together to regurgitate the same old historical images and icons onto “modern” facades. Truly revolutionary structures were dressed in traditional ornament. The architect Timothy Plueger orchestrated a symphony of artists to create his Art Deco masterpiece, The Paramount Movie Palace. A place of grand splendor gestated in the womb of the great depression. There is an escapism in it’s sumptuous interior. You can escape to another place, to another social class, a place of wealth, luxury and leisure, a place far from the streets of Oakland. I was caught off guard by the oppulance of the interior. I expected it to be beautiful, but I did not expect it to transport me from reality to a dreamlike palace. Lighting played a huge role in transitioning me from the cold world outside to the warm splendor within. The ambience was set with a dim amber hue. The lighting consisted of, “one hundred and fifty lamps in primary colors [that] can be switched, dimmed, mixed, and brightened to create a variety of hues, ranging ‘from a desert sunset to northern lights (American Art Deco, Alastair Duncan).” The lighting is transformative. It takes you deep inside a stylized redwood forest, replete with lush foliage, soaring redwoods and green light filtering through the leaves above. Everything created fits into one congruent vision, Timothy l. Pflueger’s vision. The Paramount is one of the few Art deco buildings where the architectural structure and ornament were both designed by one architect. This is apparent, a vision fully realized. I am struck by how harmonious all the details are. Every detail is considered and supports the main vision. Plueger’s Paramount Theatre is densely packed with ornament. One might expect this thickly ornamented space to feel cluttered, but no element is made redundant or monotonous by its extravagant use. This building has style and grace. She leads you through in wonderment with welcoming regality. The mathematical proportions found here enthralled me. Optical illusions built into the floor and the the abundant use of Fibonacci sequence. In looking at the built environment after leaving the theatre, I saw it in a new light. Inside the palace I was shown the possibilities for immaculate attention to detail. Then on the BART ride home, I was shown the lack of consideration for beauty and detail in the world around me. The bricks seemed unconsciously placed, their relative spots decided with purely practical function in mind, no thought of aesthetics or emotional response. The Paramount is just the opposite, Every detail was thoughtfully and consciously placed, serving to elevate the space to the level of a palace. 1929 investment properties international made an offer on the lots the Paramount theatre sits on. The original investor was Paramount publix. 1929 Stock Market Crash, the great depression ensues. American Art Deco, Alastair Duncan. Art Deco San Francisco The Architecture of Timothy Plueger, Therese Poletti. The Oakland Paramount, Susannah Harris Stone. A portion of U.C. 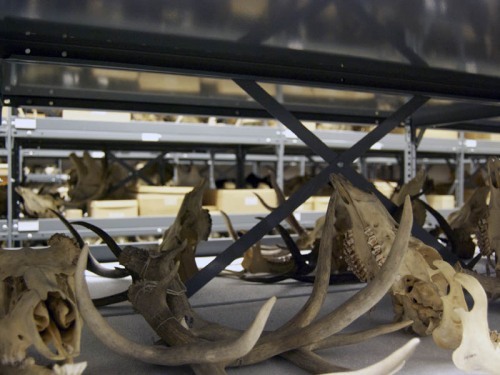 Berkeley's vertebrate collection. On a calm January day the rain subsided and the clouds allowed the blue sky to peak through. This was the day we ventured to the Berkeley Paleontology Museum to meet Alan Shabel. Through Shabel our class was granted a peak into the world of the world of the highly specialized researcher. 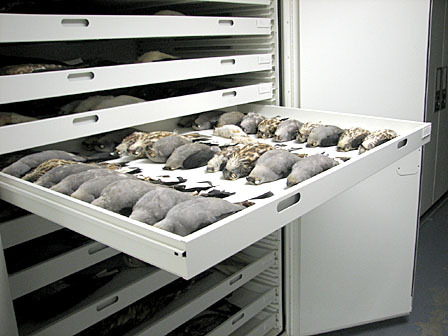 Upon entering the facility we were confronted with cabinets upon cabinets of specimens. The skeletal remains of a bird sat on the table in front of me, wired back into the form it had taken while alive. A preserved rodent stood poised on the desk. The amount of space taken up by each species was based on the amount of bio diversity within that species, the most bio diverse of species being the rats and bats. Everything was carefully preserved and labeled accordingly. I found myself enthralled with the processes of preservation, even with the care taken on the many hand written labels. I saw an immaculately preserved penguin specimen specially treated to retain it’s soft tissue. A portion of every type of tissue on this animal was preserved. I wondered about the person who had taken so much time and care to preserve this creature. Had this person considered his/her work art? I imagine that this person dedicating their life to this work, devoting their precious time to preserve specimens for future researchers. The Berkeley Paleontology Museum is a treasure trove of specimens representing an enormous amount of bio-diversity. We spent our time in the Vertebrate collection; this collection ranges from the Devonian, 417 – 354 million years ago, to the present day. The idea Alan brought to my attention that particularly captivated with me was that of homologous bones. Although these vertabrates evolved in different directions, with changes in size, shape and function, they all use common bone elements as well as homologous nerve systems, blood circulatory systems and other organ systems. Homologous bones are the bones that are the same for all vertebrates. All vertebrate’s skeletons are built with the same basic structure, the same number of bones in the same relative locations. 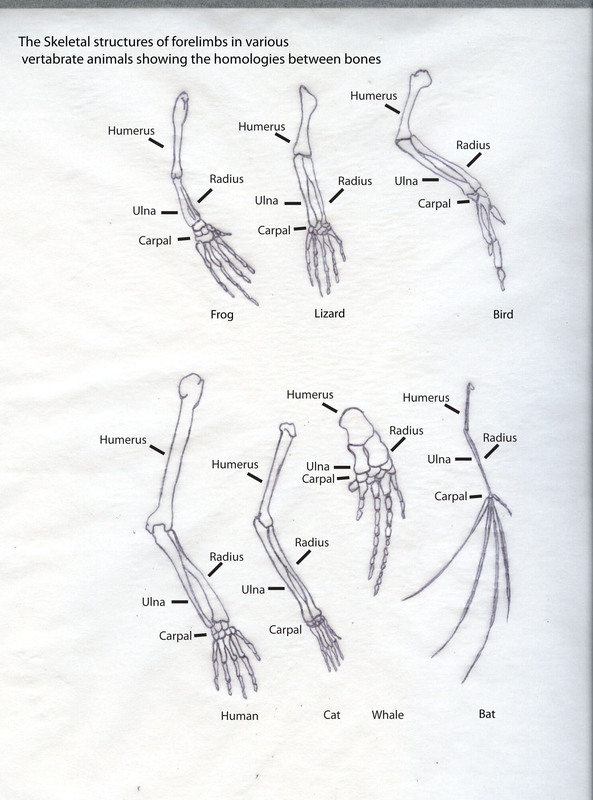 This basic skeletal structure does not vary much from species to species. Each species endowed with the bones capable of carrying out the functions that specific vertebrate has become adapted to. One example of homologous bones can be seen in us, humans, and giraffes. Both have seven vertebrae their necks, the same number in the same position. The Giraffes vertebrae are hyperxtended versions of our own. I felt a similar sense of fascination and interconnection when I was told that the structure of Heme is the nearly the same as chlorophyll. Heme and chlorophyll both circulate the essentials to all parts of the organism. Notice the structural similarity between heme, the part of hemoglobin from human blood that transports oxygen, and chlorophyll which has the unique capacity for creating energy from the sun through photosynthesis.